Food again? Well yes because a) I like eating and b) food is one of the more interesting aspects of any foreign culture. What you're seeing here is known as 'Yakiniku' (yaku='burned or grilled', niku='meat') is perhaps my current favourite food and just goes to show that food over here in Japan can sometimes be normal. This little restaurant I'm at is a short walk from my house and has a pretty good lunch set. For only 800yen (about $10 Can.) 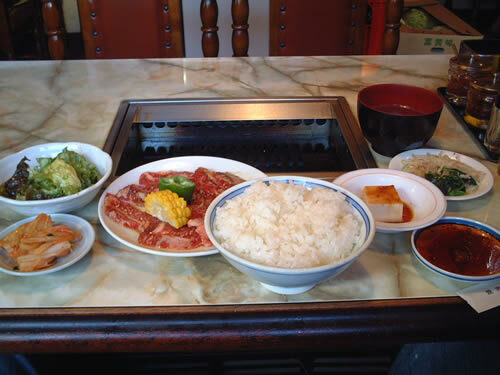 you get a plate of raw beef, which you grill yourself on a little barbeque at your table, a bowl of rice, a salad, tofu, soup, some pickled vegtables, kimchi, a drink and a bowl of ice cream for dessert. Dig in!